Earning an A on a test is like beating Super Mario Bros.
All the groundwork is established in the game’s earlier levels. You learn the foundations, steadily encounter more and more difficult levels, and generally get a sense for what the game can throw at you. You have to master each of the core concepts in order to progress. However, once you reach the final world, you have to bring your A-game (I did not intend for this to be a pun). Like any good game, the final world takes everything you’ve learned and cranks it all up to 11. It takes a lot of focused effort and practice to make it through to the end. Your classes are like this. Most of the semester is spent covering the core concepts in a slow, steady manner – and you need solid study strategies and organizational skills during this time to ensure you’re prepared. Once you enter the weeks leading up to a big test, though, you study strategies need to adapt a bit. And when you’re actually sitting in the test, you want to use every tactic you’ve got to get the best result. In this week’s video, we’ll cover 10 tips for doing those things. Some of these tips cover the process of reviewing and revising effectively, while others deal with things you can do during the test in order to achieve the best grade possible. Do a test preparation ritual, which consists of two parts. First, if you’re prone to test anxiety, take a few minutes to write down your worries and get them out of your head. 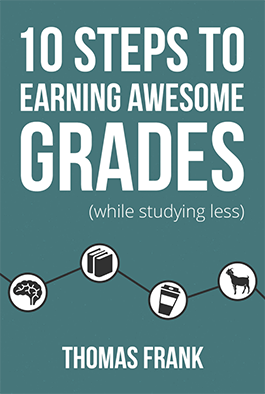 Research has shown that this actually helps students improve their test grades. Second, after the test starts, brain-dump any important facts you’re afraid you’ll forget onto scratch paper – formulas, measurement conversions, etc. Keep an eye out for questions on the test that provide clues or answers to other questions. Oftentimes, questions cover similar material and might provide insight to others. This is yet another reason why it’s a good idea to double-check your test after finishing. Do a cheat card exercise. Even if you’re not allowed to bring a cheat card or sheet of notes into the test, force yourself to make one. You’ll find that you’re compressing the most important information onto that card, thereby studying it in a very effective way. Create quizzes out of your notes, study guides, and other materials. Active recall is one of the best ways to solidify material you’ve learned, so taking those quizzes is much more effective than just looking over your notes. Simulate the test conditions when studying. Take your quizzes in the actual testing room, simulate the time constraints, and see if you can actually find old tests to study from. Everything that helps you practice in the most realistic way possible will cut down on the anxiety you feel when you’re taking the actual test. Visualize your study environment if you’re stuck on a question. Research has shown that people can often make connections to things they’ve learned when they do this, since learning is context and environment-dependent. Do at least one review session while out on a walk. Barbara Oakley’s book A Mind for Numbers points out that this helps cut down on the effects of context-dependent learning by letting you review the material independent of your normal environmental cues. Also, exercise is awesome for your brain. Apply Hofstadter’s Law – “It always takes longer than you expect, even when taking into account Hofstadter’s Law.” – to your study schedule. You need more time than you initially think to study effectively. Group small tasks in concentrated chunks in your schedule, and use the resulting blocks of uninterrupted time to do concentrated study sessions. Do these study sessions as early in the day as possible in order to utilize the maximum amount of willpower. View your tests as beautiful, concentrated bursts of recall and application. Tests are not just a judgement – if you view them as such, they’ll cause you undue stress. View them as part of the learning experience. 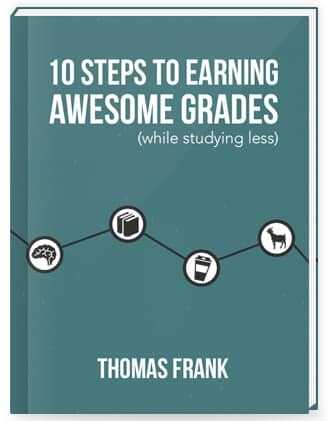 If you found this video useful, I think you’ll also enjoy the 100+ pages of study tips in my free book called 10 Steps to Earning Awesome Grades (While Studying Less).